The first time I saw Stan Lee in person, it was 2002, and I was standing outside Room 6AB at the San Diego Convention Center. Comic-Con was not exactly small at the time, but less than a third of the size it is now. But I looked down the hall and saw this huge group moving along at a fast pace, trying to surround and maybe protect… Stan Lee. Holy crap, that’s Stan Lee! And I was standing talking to Scott Zakarin, who had produced Stan Lee’s Mutants, Monsters, and Marvels, and was asking me to work on some publicity for Mark Hamill’s Comic Book: The Movie, and he said, come on, we need to talk to Stan. So I got swept up in this crowd, and it was like that scene from Rocky II with a crowd running with Stallone — and even at age 81, Stan Lee was hard to keep up with. I think he shook my hand that day, but we didn’t talk. I was too dazed. A year later, Creative Light Entertainment (Scott’s company) held a dinner for Stan Lee at Lou & Mickey’s, a steakhouse in the Gaslamp District. Packed with people who had worked on Hamill’s film, it was a great dinner mixing a few journalists, crew members, and actors together to pay tribute to the Man. And he was late, for a pretty good reason. It was his birthday, and his younger brother Larry Lieber, no slouch of a comics writer himself, was at Comic-Con to celebrate. Stan and Larry were having a steak dinner in another part of the restaurant, and when Stan was done with that, he would join us. At around 10 p.m., Stan walked in and we cheered. He sat down and ordered another full steak dinner (and finished it). 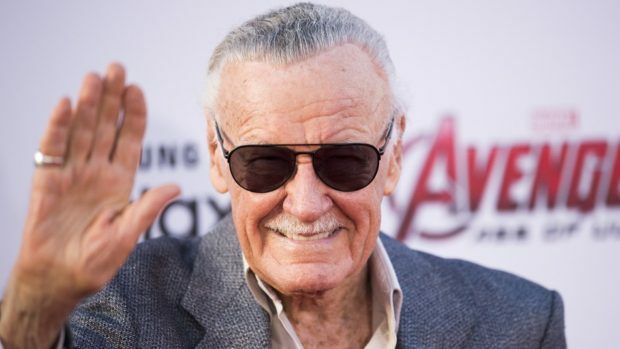 Some of the actors in the film — Roger Rose, Jess Harnell, Billy West, and Darren Norris — gathered around Stan and serenaded him with the theme songs of the Marvel cartoons from the 1960s. Stan’s face was lit up, that famous grin that if you were in the room with him you knew was absolutely real. He loved that people loved his work so much. We were brought up to his table and given the chance to tell him what he meant to us. I told him I had pretty much learned to read thanks to his work, and that my copy of Origins of Marvel Comics had fallen apart, I had reread it so much. He shook my hand and said, “thank you. That’s the nicest thing anybody could ever say to me.” And I believed it — another one of Stan’s gifts, to make you feel like he had never heard anybody compliment him before. He was really touched that he had made that kind of an impact on anybody. In recent years, Stan had his share of hardships thanks to aging and occasionally putting his trust in people that took advantage of him. But his creative spirit kept going, and his energy seemed boundless. Even though he was hard of hearing, Disney put him onstage for a presentation at D23 announcing the Iron Man Experience, and he completely ignored the carefully scripted and timed skit involving an actor in the Iron Man armor. Stan winged it, ignored his cue lines, and nobody cared because he was funny, energetic, and a legend. That was two years before Disney would officially name him a Disney Legend. Because let’s face it — Stan’s name was already up there with Walt’s, and the one really important thing about that ceremony was that maybe, just maybe, Jack Kirby’s name would get into the public consciousness, too. This past year I had one last opportunity to be in Stan’s presence, at Silicon Valley Comic Con. It was an infamous weekend, as it was finally absolutely clear to everyone that Stan had people around him that really didn’t have his best interests at heart. He was tired, he was occasionally disoriented, but he was still Stan. I had bought a picture with him for my son, and we were in line before we could have heard what was going on. I still have mixed emotions about what would turn out to be his last public appearance. As a result of that weekend, it seems as if things were turning around. A conservatorship was set up, and the people who had preyed upon Stan’s good will and fame seem to have been driven away. His last few months were spent with his daughter J.C., who confirmed that he passed away this morning. It was an honor to have met him, and though he did not always share the limelight well with the artists who certainly contributed as much, and more, to the Marvel Universe, there’s also no doubt that Marvel needed the energy and personality that Stan provided to become, well, Marvel. I’ll end with this — back at that 2002 Comic-Con, Creative Light sponsored a panel with Stan, in which Tom Kenny enthused, “he’s our modern Homer.” Already named a Legend, Stan Lee will pass into legend for centuries to come.